Gyeon Booster will help enhance the durability and hydrophobicity of your previously applied coating layer! We all have fallen in love with the durability and easy application of coatings on the market today. There is however one issue, water spots! Many coatings are susceptible to this imperfection, but there is a simple cure, a topper! The Gyeon Booster was designed and formulated for use on top of quartz/ceramic coatings (i.e. Prime or Mohs). Booster will enhance water beading drastically, helping to prevent fresh coatings from developing stains or water spots, all while increasing overall durability. The hydrophobic properties will even extend for up to 12 more months! For best results, apply straight after you apply your Gyeon coating, (or at least within the first 4 weeks of application). 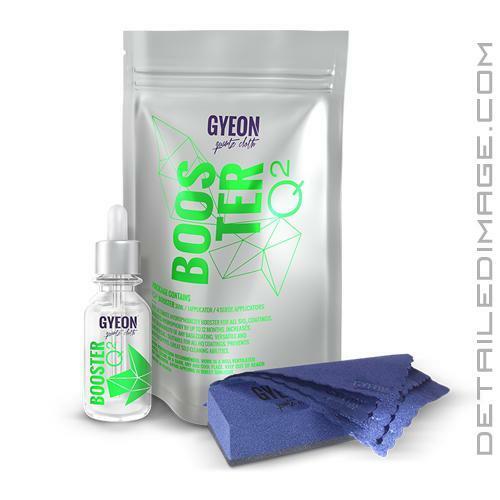 Even if you are applying on top of another coating outside the Gyeon line, Booster will work great. Gyeon does however stress that this is not a stand alone product and should only be used as a topper of an existing coating layer. If you are looking for a great maintenance topper for your coating, the Gyeon Booster is a great choice! Bonus: Includes 1 applicator block, 4 suede cloths, detailed application manual. After waiting about 24 hours I was eager to spray some water onto the vehicle to see how it reacted. Tight, round beads formed instantly, as expected. I made several attempts to create larger, taller beads, but I simply could not get them to stay on the paint without sliding off. The ultimate hydrophobicity booster for all SIO2 coatings. Boosts hydrophoby by up to 12 months. Increases the durability of any base-coating. Suitable for all HQ coatings. This product evaporates so quick I don't think it's even worth it for the price. Says it goes on invisible I was doing 3 lines for every panel. Half a 1/4 a bottle for the hood alone. It's very hard to know if you need to apply more product vice versa. Gyeon has a nice product line but I am not so sure about this one. Your customer service and speed are fantastic, reason being why I only return business to DI!